MARLBOROUGH, Mass.--(BUSINESS WIRE)--ExaGrid®, a leading provider of intelligent hyperconverged storage for backup, today announced that since 2009, ExaGrid has continued to provide American Standard with fast and reliable data backups and restores throughout the evolution of the company’s IT environment and substantial data growth. 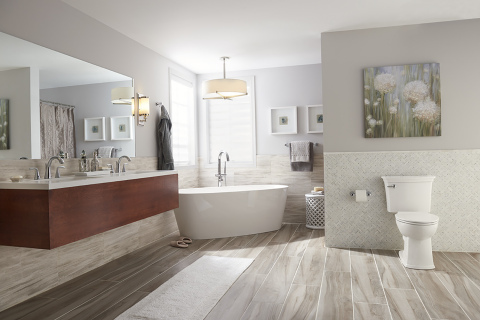 A subsidiary of LIXIL, American Standard has innovated and created residential and commercial products for kitchen and bath for over 140 years. American Standard has backed up its data to ExaGrid systems for nearly a decade, and ExaGrid has kept backups efficient and reliable throughout the evolution of American Standards’ IT environment and its major data growth resulting from the company becoming acquired by LIXIL Water Technology Americas (LWTA), a Tokyo-based global leader in housing and building materials, products, and services. “Since the acquisition, our data has grown almost 20% each year. LIXIL has continued to acquire other companies and their data has been migrated into our environment, resulting in significant data growth,” said Ted Green, American Standard’s lead information technology engineer. ExaGrid’s data deduplication has maximized disk space and reduced rack space in American Standard’s data centers. “ExaGrid is very effective at reducing our backup storage footprint, allowing us to maximize disk space,” said Steve Pudimott, manager of IT services for American Standard. “We’ve always had one dedicated rack for ExaGrid. Now it has shrunk to half a rack at our production data center. That’s pretty significant, and it’s saved us on costs since we pay for power in our data center because it’s a colocation. Without deduplication, we’d probably need well over two racks by now, but we’ve been able to decrease from one rack to just half of a rack. The newer models of ExaGrid appliances are much smaller and shorter, so that has also helped us save on rack space, too,” added Green. Recently, American Standard decided to virtualize its environment, shifting much of it over to VMware and installing Veeam to manage its virtual backups. ExaGrid integrates seamlessly with all of the most frequently used backup applications, including Veeam, which American Standard uses to back up its virtual environment, and Veritas NetBackup, which is used for the remaining physical servers. “At the time that we virtualized, our ExaGrid support engineer helped us configure our system to work with Veeam, and that was an easy process. When we installed Veritas NetBackup 16 recently on one of our servers, it took all of ten minutes to get it working with ExaGrid, and the ExaGrid plugin to work with NetBackup’s OST has been a great feature that has significantly sped up our backups,” said Green. Read the complete American Standard customer success story to learn more about the company’s experience using ExaGrid.